Do you remember, as a child, following the dots on the page to create a picture you could not imagine when you were only looking at the dots? But following the dots, a wonderful horse appears, or a beautiful flower, or even a cat! With what I call our “destiny dots” sometimes we can’t see God’s handiwork until we have finished that episode in our lives. There have always been defining moments in history whether our own personal history, or the history of our nation, or the history of the world. Many of the defining moments, what I call “God’s Destiny Dots,” in our own personal history and that of my friends, have not been chronicled. The “silver thread” running through these shared moments is the display of God’s faithfulness in small things and in the dramatic events of our lives. As you read my new book, hopefully you will gain new confidence and faith in the God who sets your destiny and provides hope for the future to anyone who will listen to His voice. 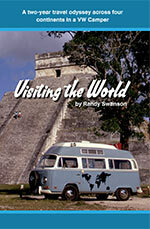 We traveled 36,000 miles, visited 38 countries, spent 2 years on the road, and experienced the trip of a lifetime. This trip could not be duplicated today with the dangers and adversity toward Americans. Laced with travel anecdotes, humorous episodes, and local history, the avid adventurer or armchair traveler will find this book a delightful read. An inspiring, full hour CD of Samantha reading the Psalms, with a relaxing musical background. Listen to it to be inspired, to relax or just learn more about what King David and the other authors wrote in the Psalms. Samantha’s deep desire has been to create a 365 daily devotional that is very personal with real life stories. Sharing the joys and pain we all experience, she has combined thought-provoking scriptures to restore, re-energize and renew you. Sometimes the devotional is intended to challenge, or stimulate your thinking and on some pages, she hopes you will laugh out-loud. Certainly, Biblical truth is woven like a golden thread through the fabric of these inspirational thoughts. 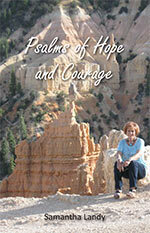 Psalms of Hope and Courage is a book you’ll want to carry with you in your car, your purse or keep by your bed, reading again and again to squeeze a God-thought into the small spaces of time throughout your day. 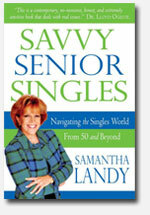 In her book, Savvy Singles, author and conference speaker Samantha Landy presents an honest, no-nonsense guide for victorious living as an older single. With humor and candor, she equips readers to become "savvy senior singles" – intelligent, unmarried people over the age of fifty who experience life in all of its fullness. Samantha’s timely advice is informed by her own personal experience. After losing her beloved husband of twenty-five years, she began searching for books that addressed the issues she was facing. 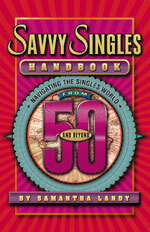 "There were countless books written for singles in the 30-50 age group, but the selection for ‘the 50+ set’ was disappointing at best – mostly empty promises presented by people who don’t have a clue what it’s like to walk in the shoes of a single, living in a world that idolizes youth and denies the validity of the natural aging process," she recalls. "The needs of a staggering number of people were simply not being met." Savvy Singles inspires readers to embrace "their best years" with hope, laughter, and a sense of adventure. 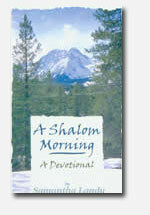 Curl up in an easy chair and enjoy A Shalom Morning. Samantha’s devotionals are often pictures of memories that will take you back in time to your own memories as she also applies a thoughtful lesson for your contemplation. Below are some of the things her friends have written about A Shalom Morning. Enjoy! "Samantha Landy’s devotional is taken from her own experiences with God and with life. That’s why you will benefit and be blessed by these essays, because her experiences are probably a lot like your own." "A Shalom Morning is spiritually stimulating as well as inspiring. Not only is it encouraging in the morning, but also before I close my eyes, I love to read one of the devotionals to dwell on as I go to sleep. That’s why I have it by my bed, to wake up with it and to go to sleep with it!" 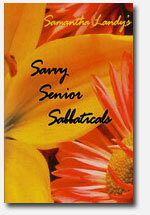 Savvy Senior Sabbaticals devotional book is a potpourri of the predicaments as well as promises of these, the best years of our lives. Join Samantha in learning to laugh about our forgetful foibles while we discover that failure is not fatal to the Savvy Senior who puts their trust in God. This is a book the savvy senior, men or women will want to keep by their bed as an inspiration before drifting off to sleep. The Living Network Notebook is designed to correlate all of your financial and personal information into one place so those people who need the details to assist you in your affairs will have it easily accessible. The Notebook is actually two notebooks, one to keep by the phone with emergency and family telephone numbers, etc. The other has all of the same information, however, it also enables you to organize your medical, real estate and financial data so your children or trustees or those you appoint to help you, will be aided with a systematic vehicle. 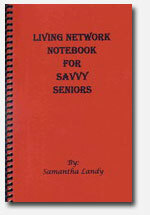 Get the Living Network Notebook today and begin to process the documents for those in your life who need it. Would you like to know what you have in common with Christian Celebrities? Now you can take their photos, signatures, and favorite recipes right into your own kitchen with you, if you have this 385 page DINING WITH DESERT CELEBRITIES cookbook! From Carol Lawrence’s Pasta E Fagioli on page 212, to the Cocoa-Pecan Pie of Adolph Coors IV on page 228, or the Lunar Bread from Astronaut Charlie Duke on page 40, or Gavin Mac Leod’s World Class Eggplant recipe on page 88, or The Lennon Sisters Chili Rellenos on page 153 and Tom Lester, from the Green Acres TV show, his recipe of Down Home Bacon & Cheese Grits on page 259. This cookbook is simply the best there is! Inside, you will find 47 other celebrity pictures, bios and recipes, including recipes from Mrs. Billy Graham and her daughters, Pat and DeDe Robertson, Oral and Evelyn Roberts and others. 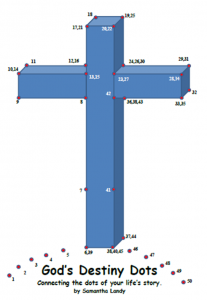 On each index page there is also a devotional, making a total of 23 devotionals to inspire you. Our desire was not only to fill the tummy but to enrich the soul. For only $19.95, plus tax and postage, you can have this spectacular 385-page cookbook as part of your kitchen library. Be the first of your friends to have this unique, beautiful cookbook. It’s a great wedding or birthday gift!